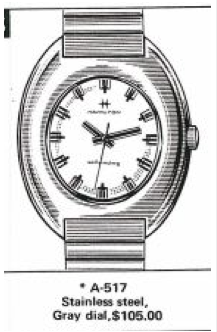 Hamilton ceased being an American company in 1969 when it sold it's operations to what is now a part of the Swatch Group... the same company that owns other high end watch lines like Omega. 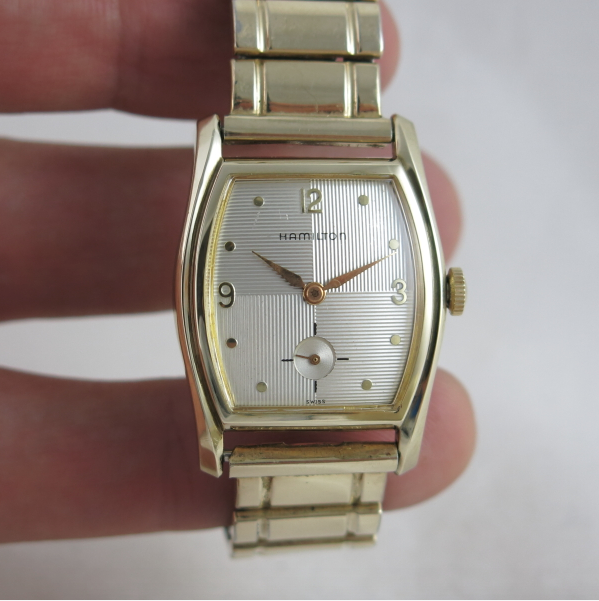 After 1969 all of Hamiltons models featured Swiss-made movements. 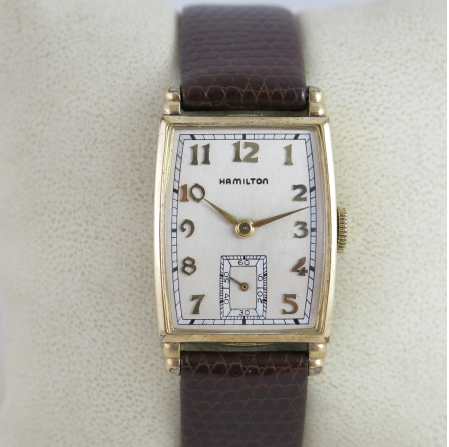 Therefore, a lot of Hamilton collectors focus mainly on pre-1970 models. I think the 1970's also brought some pretty funky, chunky and clunky designs - so that could limit what people have interest in collecting as well. Not all 1970's designs are monstrosities though - and some carry forward designs started in the 1960's. 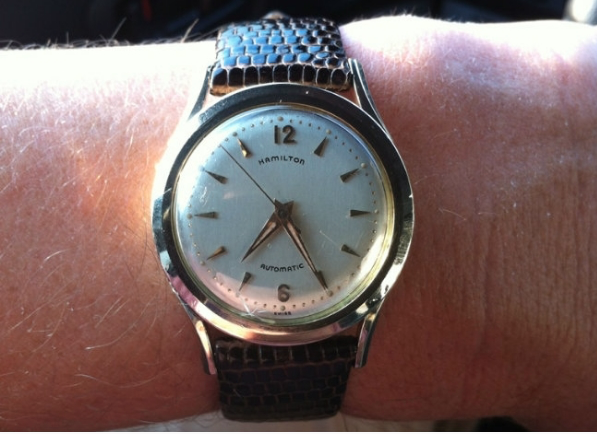 It's often hard to tell a pre-1969 watch from a post-1969 model. One of the easiest identifiers is to look inside the case back. 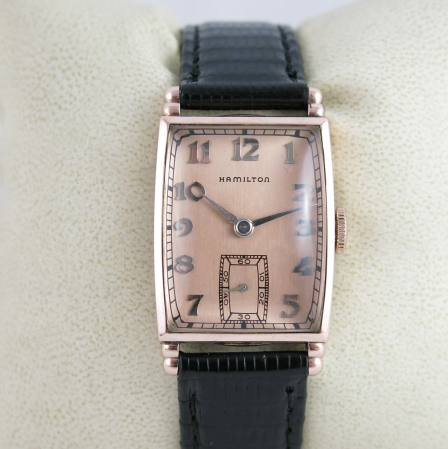 If it says "Hamilton Watch Company, Lancaster PA" it's likely a pre-1969 model. 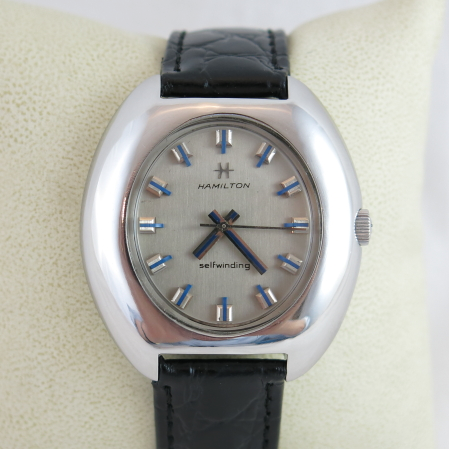 In 1970 and beyond it says "Hamilton Watch Company" and "Swiss" inside. Another easy tell is if the dial says "selfwinding". That seems to be a 1970's term for automatic. 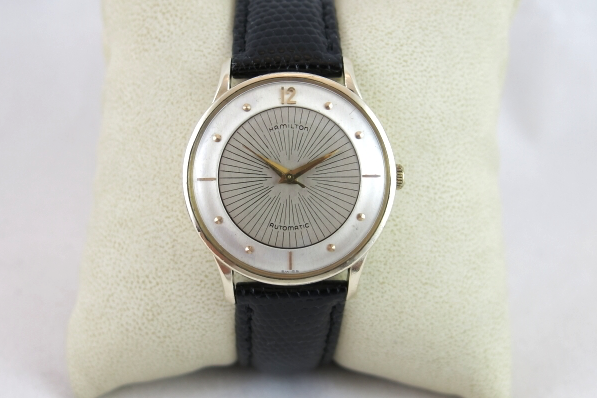 Anyway - I recently caught my eye on a 1970's watch that I thought was really cool looking. It reminded me of something Woody Allen would have worn in "Sleeper". It's a 1973 Sellfwinding A-517. 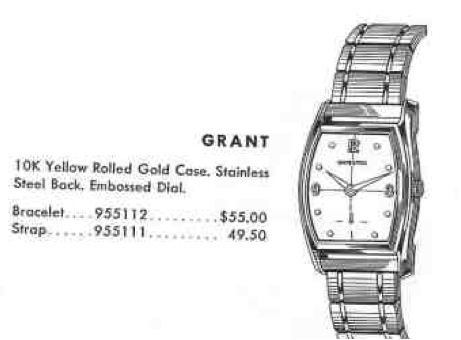 The A-517 only shows up in the 1973 catalog and the catalog is in black and white - so you don't get a good idea of what the watch really looks like in person. It's very hard to tell what the correct bracelet would be for the model but it takes an 18mm strap. It's a large watch at about 39mm wide by 43mm lug tip to tip. It's egg-like case tapers at the edges so it's a very smooth, almost sleek, design with no sharp edges other than where it meets the strap. The dial is a brushed finished gray with bright silver hour markers and blue plastic accents. The paddle-style hands are silver with a blue stripe down the center to match the hour markers. When I received the watch above, the crystal had a large crack in it. Although the bezel opening is oval shaped, the crystal is actually round. It is a flanged crystal sort of like a top hat and installs from behind the bezel. The flange is round but the stepped oval portion fits into the bezel opening. At first I thought, "Oh crap - how am I going to find a crystal for this thing?" But it turns out I was able to find it in my GS Crystal catalog (based on the dimensions) and I was able to source one with ease. Under the dial is a 17 jewel Hamilton 815 automatic movement. This is the same caliber as an ETA 2770. Now I just need to find a nice leisure suit to go with it. 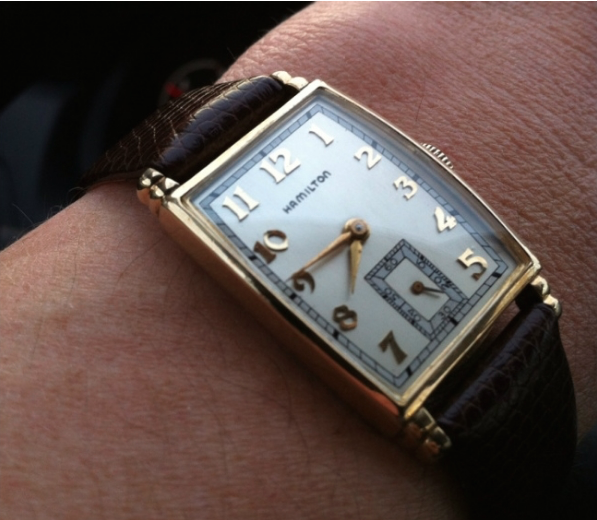 Hamilton introduced it's first automatics in 1954 with 12 different models. 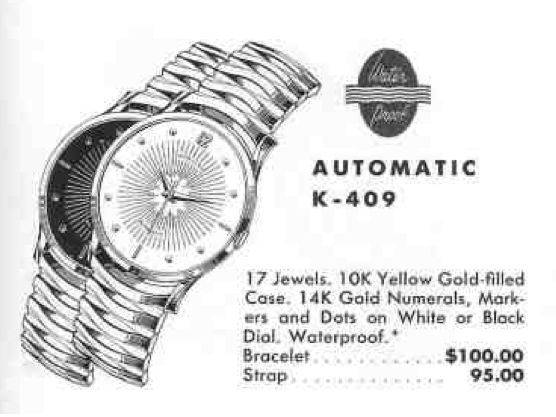 Models were named Automatic K-something with the "something" being a number. Numbers with a 1XX had 18K solid gold cases, 2XX had 14K solid gold cases, 3XX had 10K solid cases, 4XX had gold filled cases and 5XX were stainless steel. 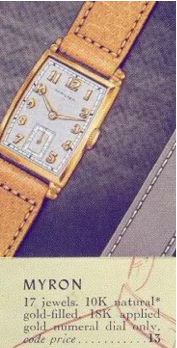 So it makes sense that the Automatic K-402 was an early watch in a gold filled case. It was introduced in 1955 and produced for three years. 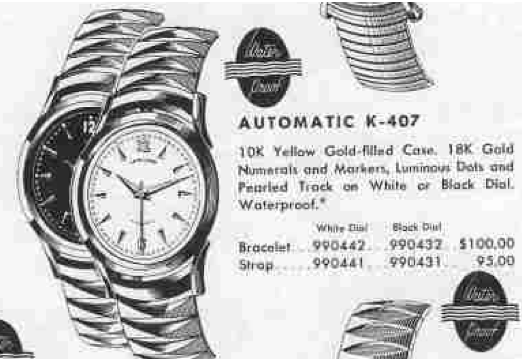 As you can see in the catalog ad, the K-402 came with a choice of black or white dials. 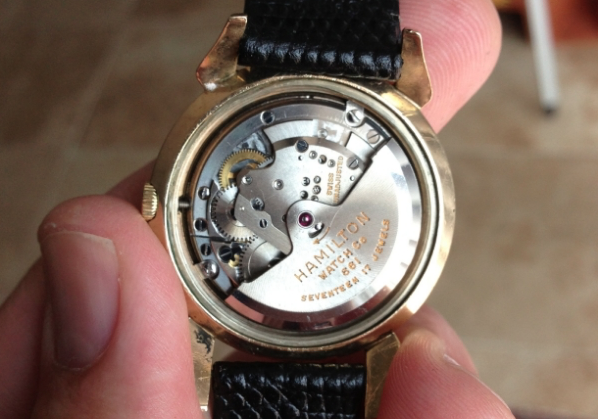 Behind the dial you'll find Hamilton's 17 jewel 661movement. All Hamilton automatics were made by various Swiss manufacturers. The 661 was made by Certina Kurth Freres and is a caliber 28.45. The little toggle-switch looking thing on the rotor is actually used to remove the rotor. Flip it to the left and the rotor will come off (once you rotate it to the right position). On the wrist, the K-402 is a sharp looking watch, both figuratively speaking as well as looking at the stepped case with sharply angled lugs, hour markers and dauphine-style hands. 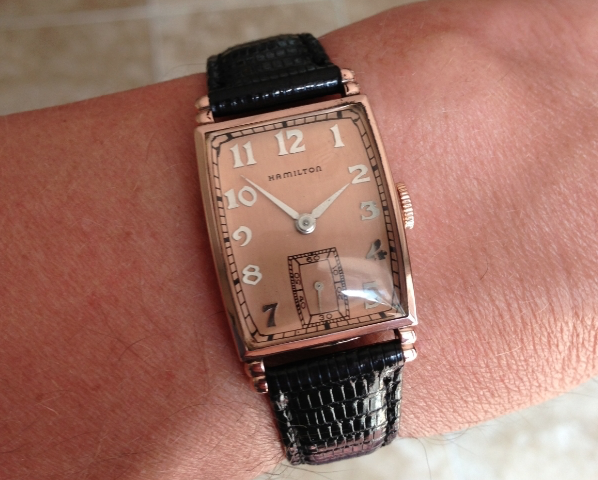 Hamilton collectors often gravitate to certain genres of watches like Art Deco, pocket watches, or electrics. 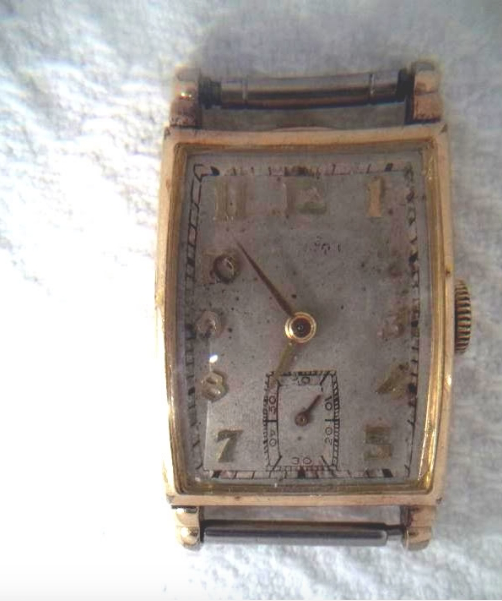 The earliest watches from the 1920's and, especially, the 1930's were often large and had very interesting engraved or stepped cases. Different dials also spiced up the offering. 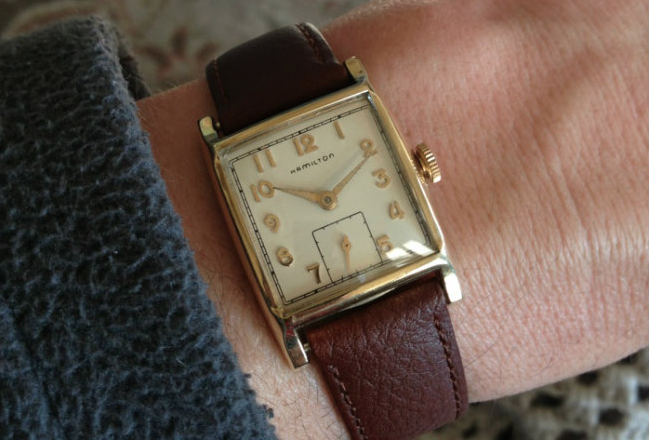 In the 1940's, watches seemed to get a lot smaller. 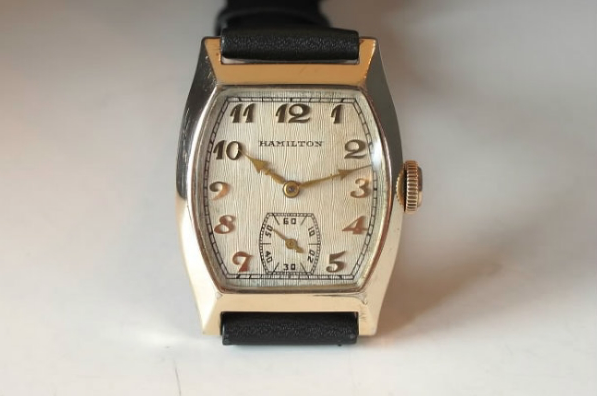 Hamilton discontinued their larger 6/0 sized movements in favor of the narrower 14/0 movements (the 980, 982 and 982M) and the newly created 8/0 sized movements (like the 747 and 748). Post WWII watches through the early 1950's are usually quite small - some would even be misconstrued as ladies watches by todays standards. 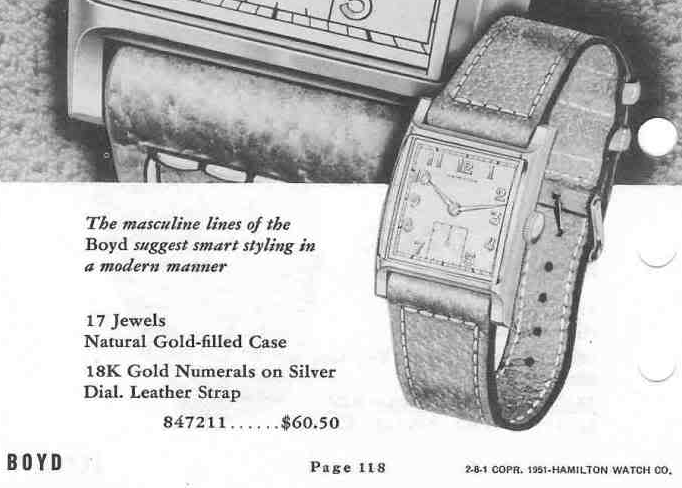 Then in the late 1950's watches started to get bigger and, with American-made movements as well as Swiss-made movements, plus the "new" Electric movements, there was a broad variety of styles to choose from. Many of the models from the late 1950's and the 1960's were down right "futuristic". 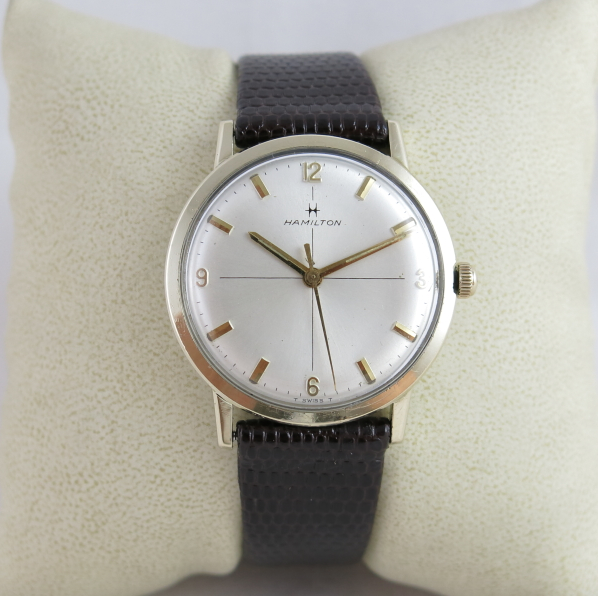 A Hamilton collector could amass a very impressive collection just by specializing in Hamilton's space-age watches from 1955 on. 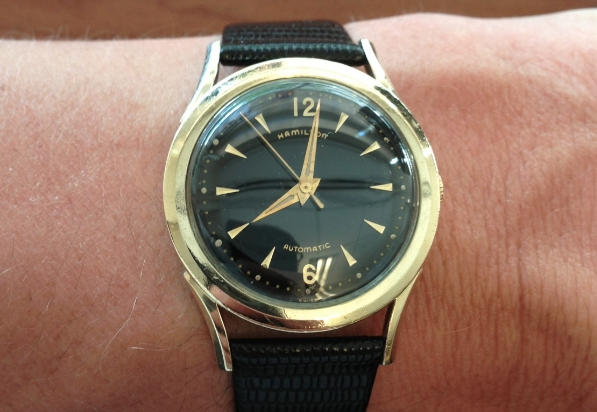 A good example of a semi-futuristic watch from this period is the 1958 Automatic K-409. The K-409 was made for two years. 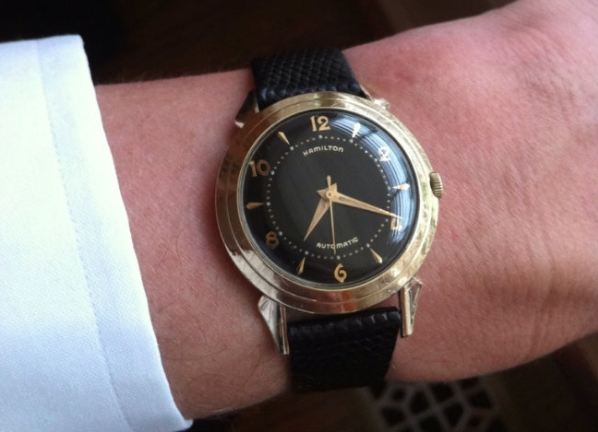 The K-409 came in a 10K yellow gold filled case with your choice of a black dial or a white dial. The dial is very fancy with a lines radiating from the center and extending to a simple band that encircled the outer perimeter. Gold numerals, dots and markers complete the aesthetic. 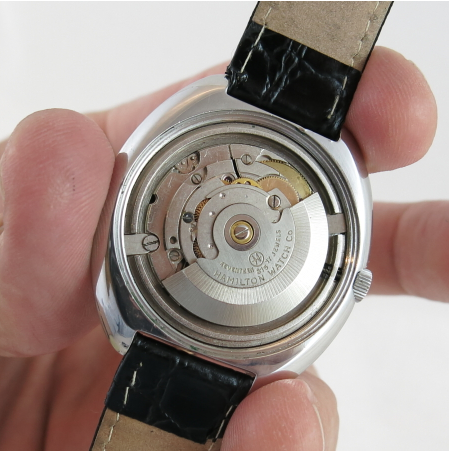 Under the hood (so to speak) you'll find a 17 jewel Swiss-made Hamilton 661 automatic movement. I find the K-409 to be an interesting but cumbersome design. The crown recesses a little into the side of the case so it tucks into the side and is hard to get to if you want to wind the watch by hand. To set the time you pull the crown out and it's better exposed - so it's a lot easier to set than to wind. Also, I think the dial design makes it a little hard to see the hands. 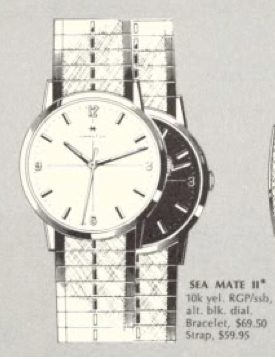 But, it's those design elements that make this watch a little different than your ordinary watch - which is exactly what I imagine the designers were trying to accomplish 55 years ago. I guess they felt that if you didn't like the design, that's cool, they had over 110 other models you could choose from. I've also restored a black dialed K-409... you can check it out here.